Last Tuesday, Drew Nieporent and Paul Liebrandtfinally unveiled their long awaited makeover of the Tribeca's Montrachet, Corton. 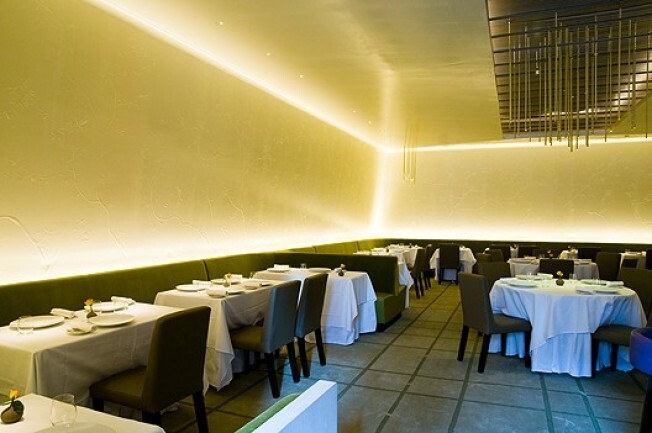 It's a more muted version of its former self with a focus on light tones, stark walls, and simple lighting, and from what we hear, Chef is attempting to rein in his experimental style. Whether it will become the staple it once was as Montrachet is up to the neighborhood and its acceptance of Liebrandt's $76 prix fixe (though it should be noted there is plan for BYOB Monday). The area has been waiting about two years for those doors to open again, yet we've heard surprisingly few opening week reviews. Gael has an early assessment of course, and the Plattster, Bruni, RG, and all the rest will follow in the next eight weeks. We await their verdicts.